The 24–7 Nutrient Monitor™ is a great all around meter for nutrient applications needing constant monitoring. It measures PPM, pH and Temperature. Both pH and PPM electrodes are placed into the solution needing monitoring. Its large illuminated green LCD display allows easy reading from a distance. This makes it so easy to keep a watch on nutrient tanks by simply walking by! Both pH and PPM are temperature compensated for accurate readings. The electrodes are replaceable at a relatively low price compared to other brands of meters found in its class. Calibration screws are conveniently located on the front for easy access. 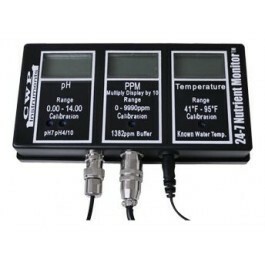 This meter uses 1382 PPM, pH 4.0, and pH 7.0 calibration solutions. The chip is programmed to use the international water standard 500 PPM = 1 EC TDS measurement. This makes it easy to share your info with family, friends and acquaintances. It uses a standard 120 volt AC current to low voltage DC power supply for safe and reliable operation. This meter has a one year warranty on the meter and PPM electrode and six month warranty on the pH electrode.